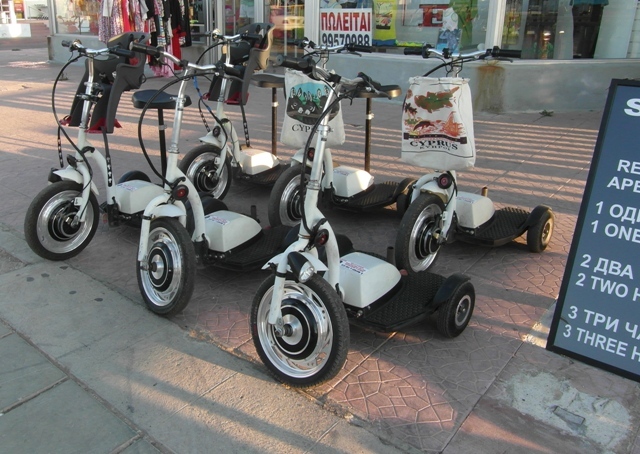 Personal electronic transportation devices or "segways" have become popular in Ayia Napa in recent years with many of them now in use along Ayia Napa's streets and surroundings. Like a cross between a trike and a hoverboard, you stand on the platform and use the hand controls to power and steer the vehicle. No licence or training is required. Segways can be hired from numerous locations all over Ayia Napa and are available from 15 minutes up to 3 hours rental. The segways need to be charged up electronically at regular intervals so must be returned to the rental agent when specified. Fun for everyone, these segways are a handy way to explore Ayia Napa as a fairly fast pace without making the effort of walking.